Who is influential? How can you be more influential? What is your reach, your amplification, your network size, your score? Tools such as Klout have begun to create a sense of what our personal brands are worth on platforms such as Twitter, by calculating what our social media influence is. By mining our tweets and social activity they apply algorithms to create our value — our score. And that score is definitely the metric of the moment. Perhaps all the angst over defining the ROI of social media has created within us a new mindset — one which needs to apply a mathematic equation to everything in order to make sense of it. In order to give it value. In order to determine how to … leverage it for business. But influence is far more touchy-feely than any mathematical equation I know. It’s not that I have a problem per se with Klout, as a firm believer of monitoring and analysis I signed up to Klout some time ago, and agree that some of the stats can be insightful (although the way they calculate what topics you are influential on is, in my mind, at best questionable), so no, it’s not really the metrics that I have a huge problem with, it’s what Klout encourages you to do that bothers me. Social media is a tool for being —social. If I was at an event and someone presented me with their business card over and over I’d hardly find them captivating. Certainly not influential. Their reach might be huge, but their quality is poor, their interaction weak, their intention self-promoting. But even more than that, when you start annoying people with broadcast tweets you begin to create for yourself a form of negative brand equity. And that’s when the exact opposite of what you were hoping for actually begins to happen. People begin to tune out, and then, they begin disconnecting. 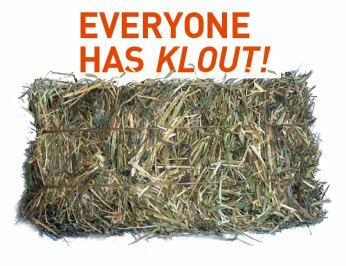 I started unfollowing excessive Klout devotees on Twitter because their unrelenting quest to score had left me feeling social media fatigued. I didn’t sign up to play popularity games. I don’t want to be broadcast to constantly. I want a social media community that is the true sense of the word; people whom I’ve connected with organically. People who have demonstrated that they may be interested in what I have to say. People who understand the reciprocal nature of social media and in turn provide me with content that is engaging. And if that means hitting the unfollow button and cultivating a smaller community of authentic interaction, then I am all for it. ‘Clout’ by dictionary definition is the special pull, advantage or influence one has. But it is also a punch, as in: I gave him a clout to the face. So next time you try to artificially raise your Klout score with a spew of sycophantic tweets and re-tweets of self-interest, please remember this — Klout might not be the tool of self-amplification that you thought it was. What you are really doing (along with possibly annoying many in your stream) is raising Klout’s own profile by buying into their marketing ploy to capture a segment of advertisers who they want to co-promote with; and make money from. Don’t believe me? Simply check out Perks and you will realise that what you are really doing with those endless Klout tweets is giving the clever people at Klout … Klout. So please, by all means, explore and utilise the metrics of Klout, but do think about the ways in which they are utilising you; and definitely think twice before polluting the stream. True and valuable social media influence will always be about the laws of reciprocity; and about growing your network dynamically via genuine, meaningful referral. It will never, for me, be about punch-in-the-face anti-social media behaviours.